Strychnos is a genus of flowering plants, belonging to the family Loganiaceae (sometimes Strychnaceae). The genus includes about 100 accepted species of trees and lianas, and more than 200 that are as yet unresolved. 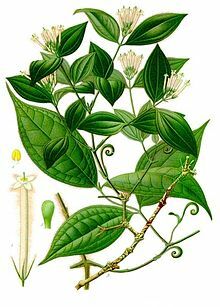 The genus is widely distributed around the world's tropics and is noted for the presence of poisonous indole alkaloids in the roots, stems and leaves of various species. Among these alkaloids are the well-known and virulent poisons strychnine and curare. The genus has a pantropical distribution. The strychnine tree, Strychnos nux-vomica, native to tropical Asia, is the source of the poison strychnine. Strychnos ignatii ("St. Ignatius bean"), is a closely related Asian shrub/tree. The species Strychnos toxifera, a principal plant source of the arrow poison curare. Three trees from Southern Africa, commonly known as "monkey oranges", are drought-tolerant and produce popular edible fruits: the corky-barked monkey orange or suurklapper, Strychnos cocculoides, the Natal orange or green or spiny monkey orange, Strychnos spinosa, and the black or spiny-leaved monkey orange Strychnos pungens. The ripe seeds of Strychnos potatorum, known as Therran or Nirmal, can be ground and used as a coagulant to purify water; or they may be rubbed against the inside walls of the earthenware water containers. Mrs Grieve's Herbal of 1931 also mentions traditional water purification uses of an Indian species called Strychnos pseudo (not a valid botanical name). Two very well preserved fossilised corollas with stamens and styles from flowers of a plant that has been named Strychnos electri (the Latin name of amber is electrum), believed to be a vine, were discovered in amber from the Dominican Republic. The amber is from tropical tree Hymenaea protera, formerly abundant but now extinct, which formed part of the forest canopy. The age of the amber is believed to be between 15 and 45 million years, from the mid-Tertiary period. This demonstrates an early date for these plants. ^ G. Annalakshmi (19 April 2005). "Solar Disinfection Studies". Deccan Herald. Archived from the original on 9 April 2007. Babu, R.; Chaudhuri, M. (Mar 2005). "Home water treatment by direct filtration with natural coagulant" (pdf). Journal of Water and Health. 3 (1): 27–30. PMID 15952450. This page was last edited on 6 November 2018, at 21:10 (UTC).